“It’s sad the waste of taxpayer dollars,” said Assemblyman Angelo Morinello, a Republican who represents Grand Island. 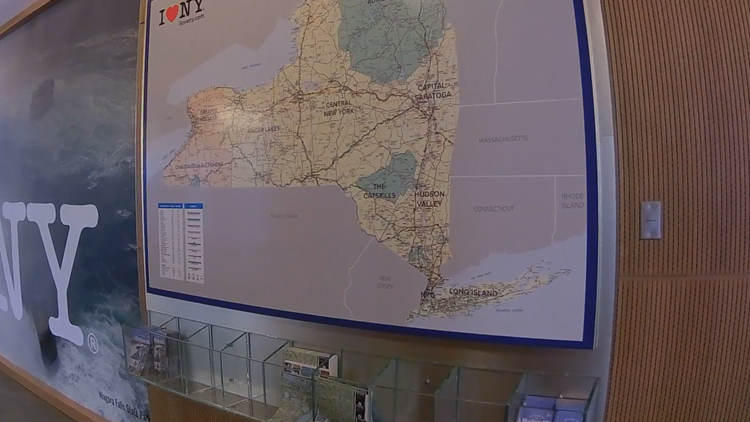 GRAND ISLAND, N.Y. — The new Western New York Welcome Center, located off the Whitehaven Road exit of Interstate 190 on Grand Island, cost taxpayers around $25 million, and 2 On Your Side can now report on exactly how a big chunk of that money was spent. Receipts, obtained through open records requests with the Thruway Authority and Empire State Development, show some of the items inside and outside the center are surprisingly expensive. “It’s sad the waste of taxpayer dollars,” said Assemblyman Angelo Morinello, a Republican who represents the 145th District, including Grand Island. Huber Construction was the general contractor for the project after winning the competitive bidding process. Huber's contract came in at $20,290,085.09. That includes everything from preparing the land, to building the main structure to installing items like benches, picnic tables and even the electric car charging stations in the parking lot. Another contract went to Jack Morton Worldwide, a Boston-based company that describes itself as a "brand experience agency." Jack Morton was in charge of the interior furnishings "to create an engaging and visually dynamic tourism hospitality hub," according to a Scope of Work document obtained by 2 On Your Side. The fabrication cost includes items like a "selfie wall" that cost $6,249; a road map area with a $9,459 price tag and $43,798 spent on some artifact display cases. The artifacts, by the way, were donated. The audio/video equipment, which was also included in the Jack Morton contract, included a large LED screen, five 55" televisions with media players, 3 touchscreen monitors with PCs and software, 2 iPad Pros, network switches and installation. That line in the contract came in at $108,108. "The extent that you're telling me these numbers are just seem to be off the chart," Assemblyman Morinello said. Outside, some items that stuck out included simple park benches that were $5,184 each (one already had a crack in it), 7 outdoor picnic tables that added up to $59,616 and almost a quarter million dollars spent on trees, shrubs, plants and topsoil. 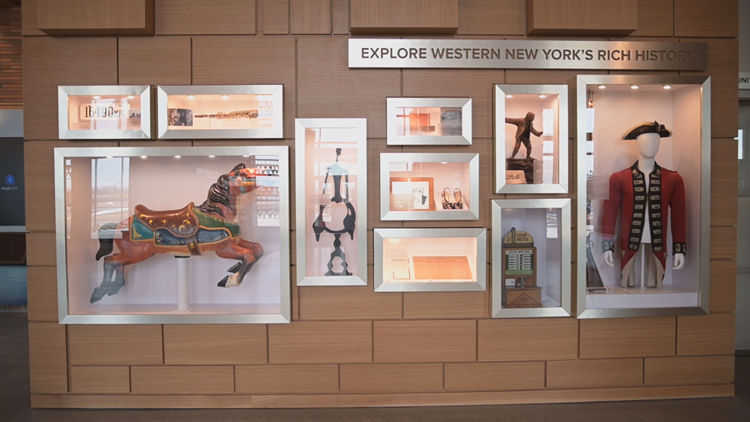 Beyond the expensive items, critics question where the Western New York Welcome Center was built. "You have to get off the main highway," explained Assemblyman Morinello. "You have no access from the main highway." That's true. To get to the welcome center, you have to take the Whitehaven Exit off Interstate 190, then take Alvin Road in order to get to the driveway that will take you to the welcome center. 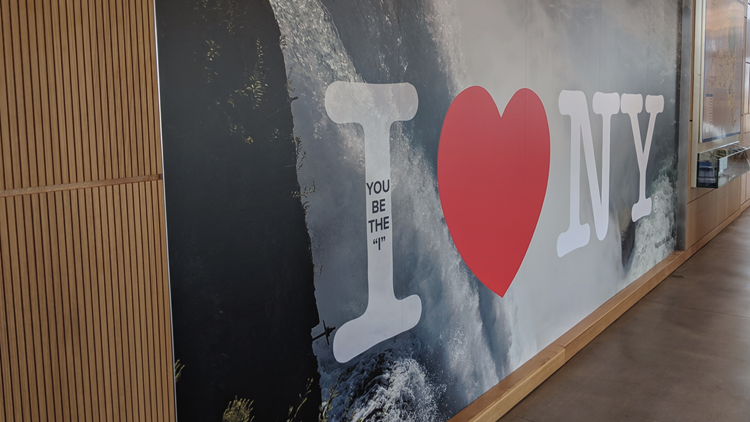 Grand Island Supervisor Nate McMurray, who was an advocate for the project, said he couldn't explain the high cost since it was a state project; however, he said he believes the center can help drive tourism traffic from Niagara Falls into the rest of Western New York. WEB EXTRA: See the contract with Huber Construction, Inc.